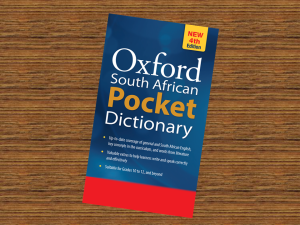 The eagerly awaited fourth edition of the Oxford South African Pocket Dictionary will hit the bookshop shelves in the second half of 2015. This southern African edition of the world’s best-selling, most practical pocket English dictionary for high-school and office reference is now even more useful and comprehensive. Though English now ranks with ten other designated official languages for South Africa, it remains one of South Africa’s major ‘languages of wider communication’. (The others are Afrikaans and isiZulu.) It is also the only world language amongst South Africa’s official languages. Since its third edition (2002), this dictionary has acquired many hundreds of new words, acronyms and phrases reflecting a remarkable range of activities and concepts, such as computing (e.g. RSS, USB, VolP, and WLAN), social networking (e.g. trend, tweet and unfriend), and popular culture (e.g. cosplay and fanzine). Not only has the vocabulary of post-apartheid developments been recorded (e.g. e-tolls, load shedding, service delivery protest, shacklord, and tenderpreneur), but many new words that uniquely reflect the way we live have been included (e.g. aikona, gees, imbizo, lekker, muti, papsak, sharp sharp, skinder, zama zama, and zef). For the first time the language of immigrants from across the African continent is also represented in entries such as bodaboda, ombike, salaula, and zesa, and an edition for southern Africa is following at the heels of its local counterpart. In addition, the fourth edition reflects the terminology used across a wide range of subjects in the CAPS school curriculum, e.g. aquaculture, extension activity, ideal gas, orthophoto, and urban heat island. This new edition also sports a brand-new Supplementary Pages section on Grammar and Spelling, Writing, and Speaking, which offers users at-a-glance guidance in how to communicate successfully, whether they are writing exams, composing transactional texts, or partaking in debate or negotiation. To order, contact Oxford University Press Southern Africa on +27 21 596 2300, or order online at orders.za@oup.com. Be sure to quote the 4th edition’s ISBN: 978 0 19 904503 7.